A new pressure sensitive needle gives feedback when it comes into contact with different tissue types, making injections into sensitive areas like the eye easier. Needles are among the most instrumental tools to medicine, and have been for over 150 years. But few changes have been made to them in that time and the shots in locations like the back of the eye must be given by specially trained professionals to reduce the risks of mistakes and complications. With a simple change to hypodermic needles, researchers at Brigham and Women’s Hospital have created a variation on the tool that gives tactile feedback to alert the user when the needle is hitting a different type of tissue. Saline, penicillin, insulin, contrast dyes, fluid extractions – needles make it possible to deliver countless drugs into the human body and to remove fluids and blood from the body. Injections are so commonplace that we hardly think about who and how someone is sticking our arms or buttocks. But if you find yourself staring a long, skinny needle point in the eye, trusting that it will slip into the small but safe space the clinician is aiming for, you might wish they were guided by a little more than their own sense of pressure and touch. Even a shot in the arm, administered incorrectly, can be debilitating. You wouldn’t be without cause either. Injuries from infections are very rare, but they happen. A study of one million arm injections over 10 years found that nearly 300 led to nerve injuries. Rare though it is, a ‘shoulder injury related to vaccine administration’ (SIRVA) can cause extreme pain and even lasting muscle damage – so even a flu shot comes with at least one worrisome risk. 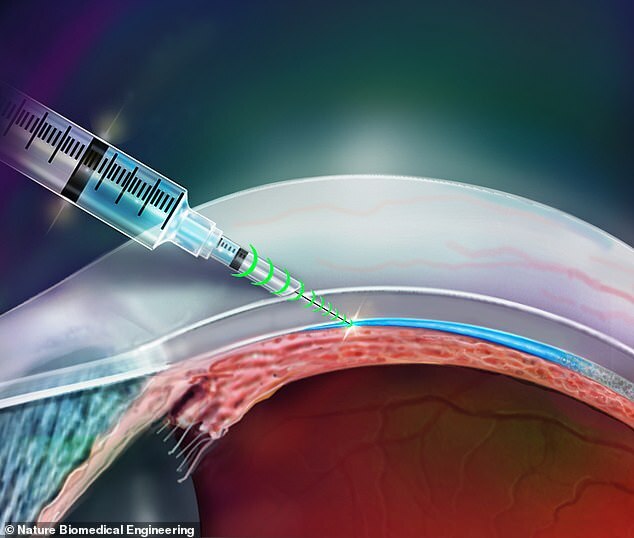 Eye injections have similarly low rates of complications to other shots, but there is the chance that a botched shot could leave a patient with a serious infection and even make them go blind. Researchers at Brigham and Women’s Hospital, in Massachusetts, had some ideas about how to prevent these painful mistiakes. To develop their enhanced needles, the team focused on the suprachoridal space – the ‘micro-thin’ area beneath the outermost layer of the eyeball, which they describe as being ‘among the most unforgiving sites’ for injections. Doctors want to be able to inject drugs as close to the part of the eye where fluid builds up and can cause vision damage as possible, but getting it right takes the most delicate touch to judge when the needle has reached the space but not delved past it into the the choroid or retina. Not only can a miss cause potential damage it may mean the drug doesn’t reach its target as efficiently. So the Brigham and Women’s team a pressure sensing needle that lets the person operating it no when its gone far enough. During tests on sheep’s eyes, the device is automatcailly stopped from going in any deeper once it senses a layer of different pressure, namely, fluid beneath the sclera. Importantly, the new form of needle can be purchased about as cheaply as the older, dumber ones. And there’s no reason to believe the system’s usefulness would only be isolated to the eye. ‘The simplicity and versatility of the [needle and syringe] allows one to adapt the design for multiple clinical applications and offers an automated approach to access the targeted tissue or cavity through an overlaying tissue layer,’ the authors wrote.